We do lose our sense of innocence and wonder at some point. It is hard to bring it back, but not impossible. Going for a walk and just walking, seeing the world through new eyes is a way to explore and recapture that innocence. At what age did we lose the ability to be exuberant without the fear of what others would think of us? When did we stop being wonderfully expressive in our joy without a care in the world? We’ve become adults who have lost or repressed the ability to feel and express our emotions purely, freely and openly. I love seeing little children show their sweet joy without a care in the world. It’s pure and beautiful. 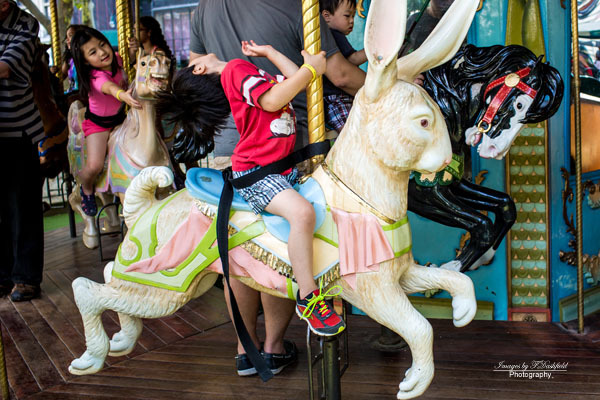 My intent was to take a picture of the little guy sitting on the rabbit but just as I pressed the button I captured a different moment in time; a little boy thrilled about getting ready to go for a ride on the carousel. Photo taken in Bryant Park, New York. Suzuki calls it beginners mind. I watch at times as my one a half year old grandson sees something for the first time. Mindfulness, supposedly takes us back to where we can be just present again, maybe never as free as that child, but able to,let the approval,or criticism fade. All impermanent worthless emotions, powerless without us giving them power. Thank you Marty. After I re-blogged, I thought of the beginner’s mind. We see and the world anew. As we mature, grandchildren become the guides in this wonderment. This is such a refreshing and uplifting share Ivon…. to be in the company of innocence and joy. Thank you! I’ve found this comes back as I get older. Along with so many other things that we let go of … being self conscious and “knowing” is being replaced with curiously wonder and gratitude. Thank you and you are welcome Val. I think aging allows us to return to the childhood we embraced. probably that’s what they called to be yourself…without any fear or shy feeling… to sing, to dance, to live….Indeed! To sing and dance like nobody is watching. Satchell Paige, an incredible baseball player, used that line to explain his success in life. I’m not sure of innocence, but being out in nature each day means that you never lose your sense of wonder. Buddhists would call that the beginner’s mind. We are always see and sense the world anew like children. the beauty in children–that lack of awareness. They are lost in it.